The Dubai Financial Services Authority (DFSA) and the Australian Securities and Investments Commission (ASIC) entered into an agreement today that sets out a framework for cooperation on financial technology (fintech) innovation. Both authorities have committed to provide a regulatory framework that promotes “innovation in financial services and regulatory compliance” in their respective markets. 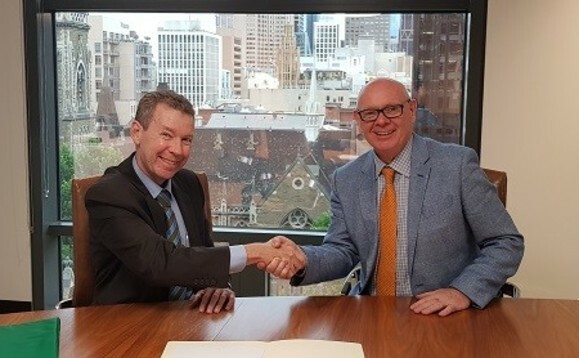 The signing took place between Ian Johnston, (pictured above right), chief executive of the DFSA, and John Price, (pictured above left), commissioner of ASIC, in Melbourne, yesterday. Under the terms of the agreement, the authorities will also share information on developments in innovation in each market. The agreement also introduces a referral mechanism that enables the Authorities to refer innovative businesses to their respective authorities. DFSA’s Johnston said that the agreement underscores the DFSA’s commitment to maintaining strong channels of communication “with our regulatory peers” and will “creates a regulatory framework that supports the latest developments in fintech innovation”. “We have a long-standing productive relationship with our colleagues at ASIC, which we look forward to extending to this fast-developing industry,” he added. John Price, commissioner, ASIC, welcomed the partnership with the DFSA to help encourage fintech innovation in Australia and Dubai and pointed that “RegTech” is becoming more and more important for the industry. “This is a new frontier in our bilateral cooperation that will benefit both regulators and businesses,” said Price. This latest cooperation agreement forms part of the DFSA’s ongoing innovation strategy, which complements the region’s National Innovation Strategy, as set out by UAE Vice President, Prime Minister and Ruler of Dubai, Sheikh Mohammed Bin Rashid Al Maktoum, to make the UAE a global hub for innovation. As reported, in August, the DFSA launched the first tailored regime for loan and investment crowdfunding platforms in the GCC. In May, the DFSA launched its Innovation Testing Licence, a special class of financial services licence that allows fintech firms to develop and test innovative fintech concepts in or from the DIFC. This also follows, as reported, the launch of the FinTech Hive at the DIFC, bringing together the next generation of leaders and entrepreneurs to address the growing needs of the region’s financial services industry, using innovative technology solutions. Its aim is to catalyse growth and efficiency in a variety of areas including trade finance, alternative finance and Shariah-based services. In March 2015, ASIC, an early leader in this field, established the Innovation Hub to assist innovative fintech businesses navigate its regulatory system. Through its Innovation Hub, ASIC engages with the fintech community, provides assistance to innovative fintech start-ups and liaises with fintech experts through ASIC’s Digital Finance Advisory Committee.